Many of the illustrations may be clicked for full screen size. FROM CIVILIAN TO W. D.
As the daughter and only child of Lt. Col. A. B. Cutcliffe, DSO, A.D.V.S., Canadian Corps, WWI in France, I had grown up hearing stories of my Father's involvement in the Canadian Army. My Mother was a Belgian lady, whose home in Ypres had been demolished by the German army. Therefore, by the time Canada had declared war on Germany in September 1939, I was keen to do whatever I could to help. When the Air Force began recruiting women, I put in an application. I could not see doing office work for the duration as I felt I would be doing that after the war was over, so opted for Motor Transport. It seemed as though I would never be called on but finally the day came when a girlfriend (now deceased) and I reported to the Recruiting Centre in Hamilton, Ontario from our homes in Brantford, Ontario. We were sworn in on January 22, 1942. We were to return there on February 6, 1942 for transport to the Airwomen's Manning Depot in Toronto. At that time we were known as the C.W.A.A.F. 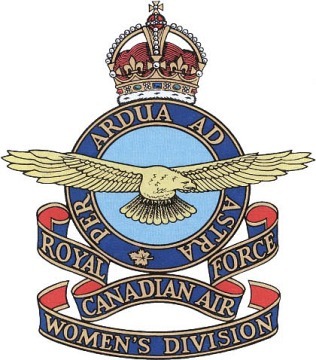 (Canadian Women's Auxiliary Air Force) but within days of our reporting, that was changed to RCAF (W.D.) -- a proud day for us to be a part of the RCAF and not an Auxilliary. For the next four weeks, we were put through rather intensive training, which included Air Force Regulations, M. T. Training and "square bashing" plus all those lovely innoculations. Then came "the Day", when our postings came through. With the odd exception, our Squadron was posted to #14 S.F.T.S., Aylmer, Ontario on March 8, 1942. Three buses were to take us there from Toronto but our bus broke down at Sunnyside, fortunately right at a doughnut shop. When the replacement bus arrived, after what seemed to be hours but likely only one hour, we were boarded again. Then our driver made an announcement that he had no idea where Aylmer was and had been following the other buses. My girlfriend and I happened to know where it was and volunteered to show him. When he found out we were M.T. drivers, his comment was "I think you picked the right job." We arrived at the outskirts of Aylmer and directed the driver down a side road towards the station. He was sure we were not on the correct road, but when we pointed to the planes taking off and landing not too far away, he had to agree that we were right. The rest of the Squadron was in the Corporals' Mess waiting for us to arrive. After a very nice welcome from the C.O. Wing Commander (later Group Captain) G. N. Irwin, we had lunch which included ice cream (an extra messing treat) paid for by the Corporals to welcome us. Afterwards we were taken to the W.D. barracks, an H-shaped building. We had arrived at last. The rest of the day and evening was spent in unpacking our kit bags, making sure uniforms were pressed, buttons and shoes polished for the next day -- then lights out. Our barracks was close to the Mess Hall and after breakfast, the six of us who were M.T. 's decided to report to the M.T. Section together. This took a lot of courage as we had no idea what to expect from the airmen of the Section. I think that almost all of them were there to greet us, and made us welcome. We were detailed to a vehicle each -- to look after and drive wherever it might be needed. My friend who was an experienced office worker, was made despatcher. I was given the C.O's car to drive - a black Ford. This meant it had to be kept clean as the black showed every bit of dirt. It also meant that I spent more time in the drivers' room, waiting to be called. G/C Irwin, a WW I pilot had his own little plane and car on the Station, so I did not have many runs. Not long after my arrival at Aylmer, I ended up with the mumps and was sent to the hospital at RCAF Station T.T.S. (Technical Training School) in St. Thomas. When I returned to Aylmer, I found out that the C.O. had decided to drive himself on the station and I no longer drove him on the Station. I was made spare driver, being given whatever vehicle was available without a driver. I drove our two station wagons, a panel truck and a pick-up truck. Then one day our Sergeant took me out on a test run with one of the stake trucks. I must have passed, because he told me that I would now be on the freight run daily. This was great news as I now had a vehicle to look after and best of all, it meant being off the station daily. On one run I had to take the cabover-engine (COE) truck and a trailer into town to pick up four crates of motors for some Hampdens, which were stored at the Station. The same sergeant sometime later told me to go down to the 'drome with one of the male drivers in a refuelling tender (gas truck) and he would show me how to operate it.' A bit of panic set in but I went -- orders were orders. After refuelling two or three planes (Harvards), I was on my own. From that day until mid-October 1943, I was driving down on the 'drome at No. 2 hangar and loving it. Sometime after I started this job, with airmen being posted out, eventually the other two hangars had W.D. 's driving the refuelling tenders. I had a great group of ground crew to work with at that hangar. In October 1943, my overseas posting came through as well as one for the W.D. driver at No. 3 hangar. We were posted to Halifax after embarkation leave, spent about a week there, then sailed on the liner Mauretania, November 24 , 1943 for England. We landed at Liverpool on December 1, 1943 and travelled by train to Bournemouth. arriving on the morning of December 2, 1943. I don't think I was ever so cold before or after that first day, finding out that it was the dampness which made it feel so cold. There were roses blooming in a park, so we said that if the roses could survive, so could we. From Bournemouth, we were sent north to No. 6 RCAF Bomber Group Headquarters at Allerton Park, in Yorkshire on the 15th of December 1943. After a driver's test on a very small Bantam truck, we were given Hillman cars to drive. As M.T. 's at 6 Group Headquarters we drove the senior officers of all sections to the various stations of 6 Group, plus other stations. I even had a run to Bomber Command Headquarters, outside London at High Wycombe. One day I had a run to Linton-on-Ouse and upon arrival there found out from the Service Police that I had driven over an unexploded bomb under the village street, which should have been barricaded off but wasn't. Another run I have always remembered was my first one to our station at Eastmoor. When we first arrived at 6 Group Headquarters we were sent out with drivers who had been there for a while and knew how to get to the stations, there being no road signs in England during the war in case of invasion by the enemy and the local people were told not to give out directions just in case it was an enemy agent in our uniform. It was a foggy day, no other driver available, so I was detailed to pick up a Sergeant at Station Headquarters at Linton-on-Ouse and take him to Eastmoor. Apparently he knew the way to Eastmoor but I didn't. As ! had been to Linton, that was no problem. It was a very quiet ride from Linton to Eastmoor as I tried to memorize every turn, reminding myself I would have to reverse them coming back. I did make it back and had no trouble getting to Eastmoor from then on many times afterwards. Another run that I shall not forget was to Middleton-St. George, the northernmost of our stations, at noon hour to pick up two officers from the London office of the Advocate-General. They had been there for a Court-Martial and were heading back to London from York on the 2 o'clock train. Our legal officer was to accompany them and after they caught the train in York, I was to return to Group with him. Time seemed to be hurrying by but the two from London were not. Finally, we started for York and I drove as fast as I could with the car governed at 40 MPH. York was just coming into sight, when there was a loud bang from the rear of the car, a Humber station wagon. I thought that a tire had blown and finally managed to stop. When we got out, to my horror I found that a wheel had snapped off. It was now very close to 2 o'clock -- train departure time! The two officers from London were quite shaky but didn't seem to realize that we were not going to make it into York. Luck was with me when a van from Group came along. The two were bundled in to it and the driver told to get them to the station by 2 o'clock. As it was wartime, thank goodness, trains were very seldom on time and they did get there in time to catch the last train of the day to London. Meanwhile, the officer from Group and I went on a hunt for the missing wheel, which we found in a field. About that time a local lorry driver that some of us had met at one of the local pubs came along so I asked our officer to go with him and let the MT section know what had happened and where I was. He was most reluctant to leave me there alone but I finally did convince him that I would be alright and if he went back to Group he could get help while I stayed with the car. It seemed hours before help arrived but they had had to go to Linton to pick up another axle with wheel attached to repair our wagon. The rest of the time, one might say was routine more-or-less. I was repatriated home on May 13, 1945 and received my discharge on June 29, 1945 having served 3 years, 158 days with the best service -- the RCAF (W.D.). I still hear from two surviving W.D's from 6 Group - one in Prince Albert, Sask. and one in Sherbrooke, P.Q. Not many of us left now. I met my husband, Arthur Woodland at 6 Group and we were married there in February 1945. He passed away in 1998. There are so many stories that could be told of those days, the characters we met, the places we were sent to and the many sights we saw as well as all the good friends we made. Some have left us but I am still in touch with a few after all these years. There were a lot of laughs and there were some tears but I would not have missed my three years as a WD MT driver. Rosalie Woodland died on January 31 2017 in her 97th year. She was the beloved wife of the late Arthur Woodland and mother of Paul (Blossom), Eric (Barb) and Ann Woodland. She was predeceased by her friend John Wright. The County of Brant’s (Ontario) Album of Honor is a wonderful example of the respect and thankfulness that the casualties and returning veterans of World War II received from loved ones at home. 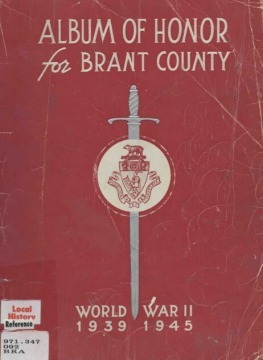 The County of Brant and its largest population centre, the city of Brantford, contributed 6000 of its 57000 citizens to Canada’s armed forces in World War II - roughly one in ten - close to the average for the whole country. 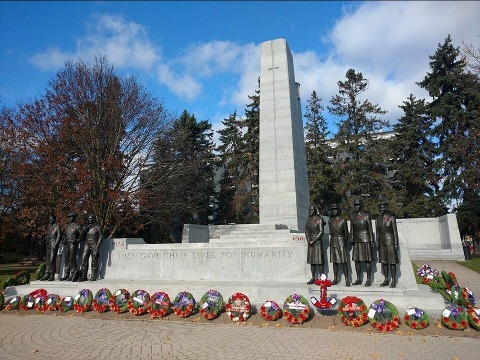 This county’s remembrance project was one of many projects similar to that in just about every other city, town and county in Canada. Books, plaques and statues were the most popular way of honouring those who were active in our armed forces. In researching the subject of our Canada 150 Vignette number 55, LACW Rosalie Woodland, her name came up in Brant County's Album of Honour. This fine work has been uploaded to the intenet by the Brantford Public Library. It is an impressive work with 224 pages devoted to the County's veterans and casulaties. 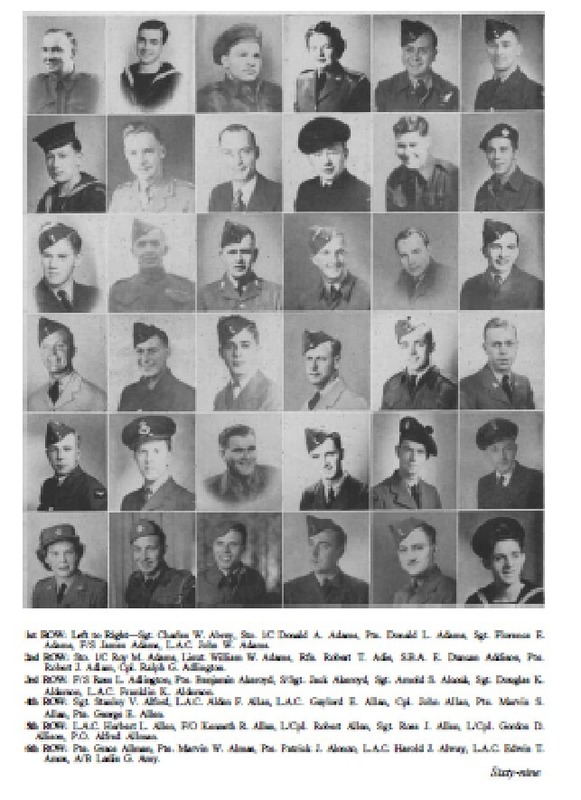 Approximately 3500 of the surviving vets are included with their names, ranks and photographs. Another 1500 or so are listed with name and rank only. 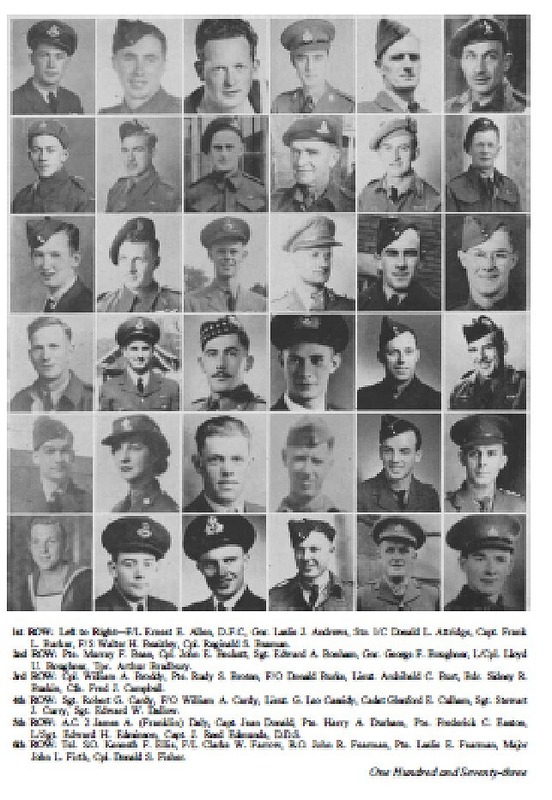 Unfortunately, the internet copy of the Album of Honour does not include the 55 page section listing casualties. However, many of those names can be found in the section sponsored by local businesses and institutions wanting to show honour to their employees who joined up. We present to you the cover, a few of the veteran’s photo pages, a business entry and the album’s moving introduction as written by Ms. Helen Sanders, editor of the album. We also show a photograph of Brantford's impressive Cenotaph. 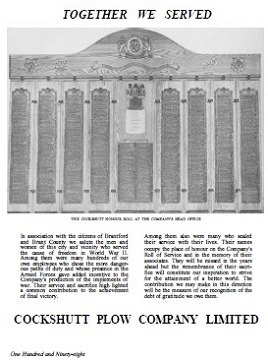 INTRODUCTION During the Second Great War some 6,000 of Brant County's population of upwards of 57,000 enlisted in the armed forces. Six thousand men and women — a formidable force in themselves — donned the King's uniform and followed their assigned paths of duty. A relative few were destined to go no farther than Ontario training centres. Others were posted to more remote places in Canada — to eastern Debert or to far western Nanaimo. More embarked on the great troop transports and were carried to the preparatory fields of Great Britain, before proceeding to the battlegrounds of distant Africa, Sicily, Italy and Europe. Still others, particularly those who wore the blue of the Royal Canadian Navy, sailed the high seas half across the world. They fought and many of them died, following their hazardous courses through the ice-ridden ocean that tops our land, or over the grim Atlantic, or into the waters of the tropics. And while the majority of the men in the grey-blue of the Royal Canadian Air Force trained in Canada and Britain and went on missions in the skies over Europe, not a few found themselves in countries until then no more than exotic names in their geography books. And so it was that even the youngest school child here grew familiar with names such as Burma, Rangoon, Singapore, Hong Kong, Reykjavik, the Po, Monte Cassino, Normandy, Bergen op Zoom, Nijmegen, Hochwald, and the rest — wherever their fathers or brothers or other relatives and friends were serving. Indeed, the places Brant County men and women reached in waging the good fight were so varied and at such distant points that, if a list were compiled, it would resemble a Baedeker guide-book. A glance at the photographs in this Album of Honor will show that it was the youth of our County, the young in heart and years and physical fitness, between the ages of 18 and 50, who made up this great force. They went from the classrooms, the factories, the farms, the offices and the shops. They were our young professional men — doctors, lawyers, teachers, engineers, chemists. They were our store clerks, mechanics, carpenters, bookkeepers, reporters, photographers and schoolboys. Some were still students. Still others, having left school during depression years, had not been fortunate enough to secure permanent positions. Some were leaving behind their first jobs, their new marriages, their infant children. But all possessed a singleness of purpose. Once they lost their civilian tags in the common denominator of a uniform, their aim was the same — "to finish the job". It would be superfluous to say that the photographs and names in this Album of Honor represent the best of our youth. A glance at the pictures shows that. But we who remained at home can appreciate, remember and honor the valor they displayed after they were transplanted from our community. We shall remember our Navy and our dauntless sailors who served on waters infested by enemy submarines and surface craft of war, all carrying their deadly freight. There was such little fanfare accompanying the Navy's job — sometimes all the more deadly because of the monotony and the necessarily cramped quarters — that we give those who went down to the sea in ships a special place in our hearts and our limitless gratitude. We shall remember our forces who fought at Dieppe and the essential service they rendered. We shall remember that hot July 10, 1943, when the invasion of Sicily began, precursor to the battles in Italy from Reggio to the Po. We shall remember the lonely heart-breaking years our men spent training in England preparatory to June 6, 1944, and all the grim days that followed invasion of Normandy. We shall remember Beny-sur-Mer, where so many were laid to rest in consequence of the bloody struggle that preceded Caen and Falaise. It was our youth who fought through Italy, France, Belgium, Holland and into the depths of the enemy country until the foe surrendered, and it is hoped that this Album of Honor will serve to keep alive the recollection of their glorious deeds. 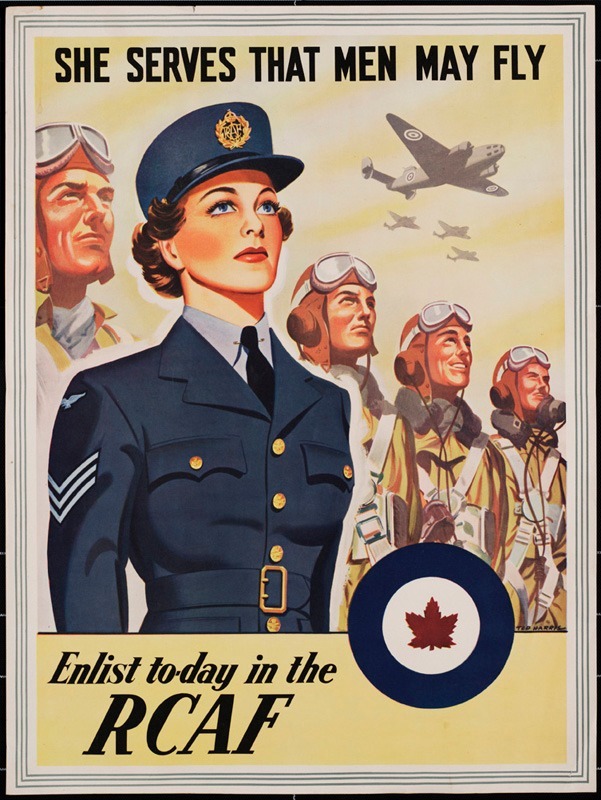 And finally, there are those who were numbered with the Royal Canadian Air Force, a mighty factor both in the averting of defeat and in the winning of victory. We shall remember, as a glowing and radiant light that shone in the dark pre-invasion days, the bravery of our airmen who flew above the enemy's flak-filled skies. Then it seemed almost suicidal to be among those gallant crews who blazed the trail to the final and mighty battles that were to end the war. Let us also not forget the sturdy ground-crew personnel, who besides devotion to duty were possessed of the knowledge and skill to "keep them flying". We have still one more group to which to pay tribute in our remembrance: the nursing sisters, whose skilful and sympathetic ministrations were so indispensable, the Wrens, the Cwacs, the R.C.A.F. W.D. 's, who shouldered the heavy, unglamorous and routine tasks that men might be spared for sterner duties. They did the humdrum willingly and well, and their recompense came with the successful conclusion of the war. This side of memory to pay our debt. The qualities they gave, nor to forget." This, then, is the excerpt: ". . . .
"I find myself staring into space wondering what I can write about, what I can say to you at home. Much will have happened by the time you receive this. The radio and newspapers will burst forth with news of all the latest events . . . But the radio or the newspapers can not convey to you the thoughts I have at this time. . . . "
"You and I have heard of many chaps who, under circumstances such as this, write touching letters to be forwarded to their loved ones — 'just in case'. I must admit that I thought of it myself, but decided against it. " "As you know, I am a very practical person. I am also a bit of a fatalist, feeling sure that what is to be will be, that whatever happens it always happens for some good reason, although we may not realize it "
"Great things are in store for me — for us. I will speak only of myself, but what applies to me applies also to thousands like me. I am a part, however small, of a great force which, in the months to come, will bring the war in Europe to a victorious conclusion. " ". . . curiosity, the will to fight and win, and many others which I am finding awfully hard to put into words. " "Of this I am sure: I am not afraid of Death. I believe sincerely in a Hereafter, and I have no regrets for the life I have led on this earth. I have had more than my share of joy and happiness. . . . "
"Now I am wondering what your thoughts are after having read my letter thus far. Have I been too outspoken? I don't think so, for I have only spoken OUR thoughts. " It's like this: We have a job to do. We'll do that job, and we'll look after ourselves while doing it. I know it won't be easy for you folk back Home, but we do ask you to keep smiling and not to worry. Just carry on as usual, for us. 'Monty' himself says we can beat Germany in six months. Think of that! Just six months — if all goes well. Of the Canucks. 'Monty' is quoted as having said that 'the only thing the Canadians will stop for is to read their mail.' He can say that again!" ". . . . And now there doesn't seem to be much left for me to say. Once again I ask you — all of you — not to worry too much, to keep the Home fires burning, and, with all us lads over here, look forward and hope and pray for that glorious day when we'll all be together once again..."
It was written June 3, 1944, by L/Sgt.' Walter Roy Dowden, fourth son of Mr. and Mrs. Walter J. Dowden, 5 Dover Avenue, who was killed in action six days later. We shall not forget them nor those who fought and labored at their side. The publication of this Album of Honor reflects the conviction and the faith that the Freedom so dearly bought by so many lives and so much effort will be treasured and nurtured in the hearts of all for whom it has been preserved. Alex Matheson was a long-time volunteer at the Commonwealth Air Training Plan Museum. He was well respected and liked for his easy going manner and true interest in people with who he interacted. In 2001, Alex sat in on a CATP Museum Oral History video interview conducted by the museum’s Kathy Sheppard in her first job with us as Oral History Facilitator. 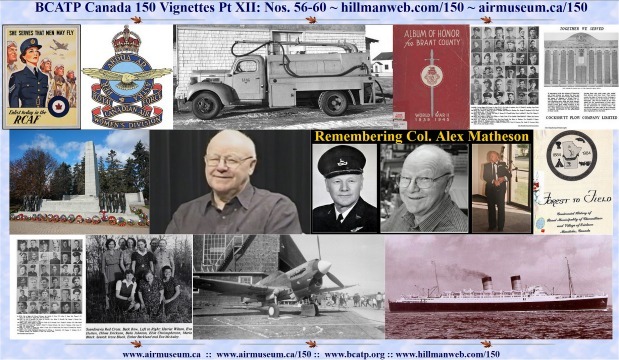 In the hour long interview, Alex, with the help of Kathy presents a comprehensive and interesting explanation, with a dash or two of humour, of training for an airman new to the British Commonwealth Air Training Plan. This included the first stop in the RCAF – the Manning Depot – to the last – graduation and the wings ceremony as airman eligible for operational training. View this truly enjoyable hour on YouTube at:. Alex died at the age of 91 years on May 16, 2016. 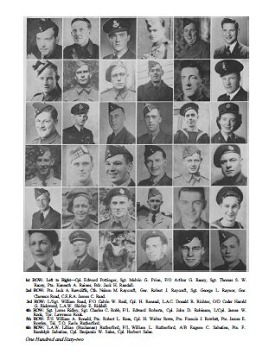 He was member of the Canadian Armed Forces for 33 years first enlisting in the Royal Canadian Air Force in July 1943. He completed his BCATP training as a pilot, but due to his graduation coming close to the end of World War II, he did not see action in an operational unit. He transferred to the army and built a career as an officer in the Royal Canadian Dragoons, an Armoured Corps Regiment. His military career took him to various locations in Canada as well as Korea, Cyprus, Laos and South Vietnam. He retired in 1975 as a Colonel and Commanding Officer of CFB Shilo. In retirement from the armed forces, he became an art illustrator at Assiniboine Community College in Brandon where he eventually became President of the school. 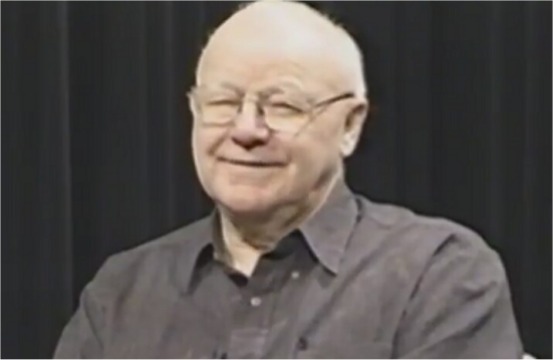 Alex was active in many community groups in Brandon such as President of the 1979 Canada Winter Games, the Brandon Rotary Club, Royal Canadian Legion and CATP Museum where he was a frequent Master of Ceremonies and also, the artist for over 60 issues of our CONTACT newsletter. Alex is survived by his wife Peggy and four sons. During World War II, hundreds of home-front groups were formed to provide aid and comfort to those who were in the armed forces or were refugees in foreign countries. Many groups were local volunteer groups for larger organizations like the Royal Canadian Legion and the Canadian Red Cross, The organizations provided guidelines and goals in how each of the small committees could help. With men away from the community in the army, navy or airi force, their numbers were considerably less than the female population in each community. As such, women did the lion’s share of work in groups raising funds and making clothing items and providing a much needed boost to morale in their communities where all were concerned about the welfare of others fighting in far off places. For the woman, the work provided plenty of positive social contact and something to take their minds off of the woes of the world. The Legion became a valuable resource for returning veterans by offering good advice and information of their options back in civilian life, especially by helping them access government readjustemnt programs. 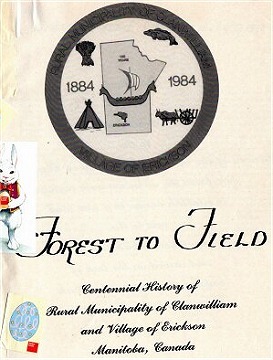 Our dedicated Commonwealth Air Training Plan Museum volunteer Judith Grierson – Treasurer and Adjutant – brought to the museum her copy of the Centennial History of the Rural Municipality of Clanwilliam and Village of Erickson, produced in 1984 as a book thoroughly outlining all things historical happening in that place in its hundred years. Volunteers scoured the municipality for family histories, photo albums, institutional records, newspaper articles etc. to be collated into this book for the edification of residents. Of particular interest to us were the entries relating to home front activities of World War II. We have taken excerpts from the book explaining how local organizations were created and undertook making the world a better place during World War II, It is an amazing example of what this tiny municipality (population 1631 in 1941) achieved for the war effort. The Rural Municipality and Village of Erickson within in borders is about 50 miles north of Brandon Manitoba. This story is even more incredible when one thinks to multiply the results of this place, many times to represent the efforts of other every village, town and rural area across Canaada – that’s a lot of sock and quilts. We provide to you, a summary of the reported activities of the Battle of the Canadian Home Front as it occurred in Clanwilliam during World War II in addition to supplying 205 men and women to the Canadian Armed Forces of which 20 became casualties. The Canadian Legion Erickson Branch of the British Empire Service League, was formed in 1939, and received their Charter on June 29th of that year... Membership fees were $2.00 then and per capita tax was .45¢. On Friday October 27th the first joint meeting with the Ladies Auxiliary was held, with the ladies providing lunch… Donations were made to the Red Cross to buy blankets, and to an ambulance fund, also to the local restroom. On November 11th, 1940, members of the Legion of the Erickson district held their first church parade to the Lutheran church. Visitors were present from Crawford Park, Wasagaming, Onanole, Sandy Lake, Rackham, Hilltop, Scandinavia, Clanwilliam, Rapid City and Minnedosa. About one hundred persons, Legion members and their wives marched in body from the hall to the church, where Rev. Richard Odelberg took charge of the service. During the war years. barn dances, teas, picnics etc. were held to supply money to buy articles for boxes for the boys overseas, ably assisted by the Ladies Auxiliary. In 1941, a Remembrance Day Service was held by Rev. Thomas Payne. Christmas parcels were sent to service men. The rent paid for dances held in Scandia Hall was $6.00. In 1943, Lloyd Hemmingson joined the branch, the first veteran of World War 2 to do so. 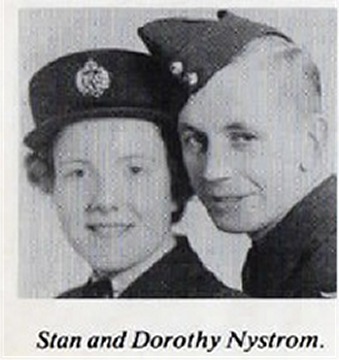 Pilot Officer Fred Wickstrom, Pte. Mike Kozak, Pte. W.E. O'Brien, and Sgt. 0. Haralson were reported killed in action. In 1944 some veterans were coming home and the Legion helped them get re-established in civilian life. In 1944, seventeen new members joined the Legion. On August 14, 1945, citizens of Erickson and District turned out in masses to the "Welcome Home" social held in the community hall in honor of fifty local servicemen recently returned to the district. Mr. E. L. Johnson, President of the Erickson Rehabilitation Committee assisted by Mrs. R.J. McKenzie and Mrs. Val Bizco presented each of the guests of honor with a small token of appreciation from the community. The "Welcome Home" address was delivered by Dr. E.J. Rutledge, MLA (Member of Manitoba Legislative Assembly). Since the social fell on V.J. Day, a monster bonfire was built on the street close to the hall and following lunch the party gathered around the blazing fire. The evening concluded with a dance with music provided by Mutter's Melody Makers. On October 14, 1945, guests of honour at Erickson's Second Welcome Home, 41 veterans met in the Lutheran Church, where they were presented with monogrammed wallets and welcome home certificates. Addresses were heard from Dr. Rutledge and Rev. C. Sevig. Again on December 26, 1945, a welcome home in the form of a whist drive and dance was held for 50 more returned personnel who received wallets and certificates. R.J. McKenzie gave the address of welcome and made the presentations assisted by Mrs. Val Bizco and Mrs. L.
In 1946 the members started discussing the building of a Legion Hall. It was decided to get a permit from Riding Mountain National Park to take out 12,000 feet of lumber, at a cost of $15,000 per 1,000 feet. This was done but the lumber was later sold to members W.T. Turner, J. Cutter (J.C. Farm Machine) and to the Elphinstone Legion… A decision was made to look into buying the Hostel from the Park, at a cost of $300.00. The hostel was officially opened June 15th, 1943, and for three summers it was used by service men and women from many Allied countries. Legion and Auxiliary members from Crawford Park, Onanole and Erickson were hosts and hostesses there. The main part of the building was moved on to the property on Main Street, purchased by the Branch. Mrs. O'Neill of Onanole bought one wing and Mr. Doan the other. Comrades W. Miller and P. Vaughan loaned the Branch the money to buy the building, the cheque was sent to War Services March 22nd, and the loan was paid back in 1947. The building was moved by Gordon Hedges, men who worked on getting it ready for use included H. Frederickson, E. Eblin, Gust Bergstrom, O. Olson, Chris Olson, Roy Johnson, who hauled sand and gravel and Jack Hicks who did the wiring. The Ladies Auxiliary gave $ 100.00 toward the expenses. The official opening was held June 17, 1 947. The men served lunch for the Ladies one evening, which has been continued each year since, at the February meeting. The support received from the people of Erickson and the surrounding area, in all their endeavors has been the secret of their success. And, as with all Legion branches, they give a great deal of credit to their Ladies Auxiliary. It is hoped all their friends and supporters will soon be helping them celebrate the burning of the mortgage. Mrs. William Taylor arranged a meeting to be held in the Municipal Hall in Erickson, the purpose, to organize an Auxiliary to the Erickson Branch of the Legion, on Friday October 27, 1939. The meeting was a success, and on December 11, 1939, they were granted a Charter. The Charter members were:… The meetings were held in the Municipal Hall, and they decided to hold them on Friday nights, the same as the men. The initiation was held on January 6, 1940. The per capita tax was twenty-five cents per member per year, but a few years later it was raised to ten cents per member per meeting, and had to be sent in quarterly. In 1954 they changed it, to having the per capita sent to Winnipeg annually. This amounted to dues being $1.20 per year, an amount that was raised to two dollars a year in Erickson in 1982. April 20th, 1916 During the winter months the ladies of the Red Cross Society of Scandinavia were not idle, but had accomplished a fair amount of work. Goods had been handed out to different homes and returned completed to the President, Mrs. E. Waterton. They had been made up by the following: Mrs. R. Naslund, Mrs. Hodgson, Mrs. E. Hemmingson, Mrs. Fletcher, Agda, Mabel and Mrs. P. Johnson, Mrs. Kalberg and Ellen. Miss Helge Hemmingson was the secretary. Fifty Christmas stockings were made up by Scandinavia, Hilltop and Danvers. In 1917, the statement from the secretary of the Scandinavia Red Cross stated that contributions by Red Cross Aid for Christmas stockings for wounded soldiers from Hilltop was $16.40 and from Scandinavia $21.10. 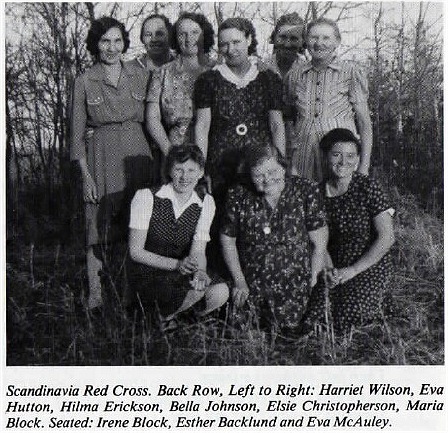 A Red Cross cushion social was held a Swinburn's farm residence in Danvers. On January 24, 1924 the Minnedosa Tribune ran an article which read that a relief society had been formed here with Mrs. E . Rutledge as president and Mrs. T .E. Squire as secretary. The society would operate with a view of giving assistance to needy families in the surrounding districts. There seemed to be a great need for an organization such as this, in and around Erickson, and everyone should lend every possible assistance. At the open meeting called by Dr. E.J. Rutledge, a branch of the Canadian Red Cross was formed at Erickson and a charter had been applied for. Erickson was chosen for the central headquarters for the R.M. of Clanwilliam and the Unorganized Territory to the north. An executive committee consisting of representatives from all organizations, the Municipal council, churches, and schools throughout the district was appointed… Dr. E.J. Rutledge MLA was appointed chairman of the War efforts organization with L. W. Miller as secretary.,, Line elevators were responsible for gathering scrap metal. The Units forming the Erickson and District Red Cross were Erickson, Hilltop, Scandinavia, Whirlpool, Danvers, Clear Lake, Onanole, Lund, Westmount, Nedrob, Norland, Rackham, Round Lake, Clear Lake School Division and Clear Creek School Division. Compiled from the minutes as entered into their journal dated March 2nd,1942 to November 11,1947: The meetings were held in the Erickson Municipal Hall with one regular meeting held on the 1st Tuesday, and a quilting meeting on the 3rd Tuesday of the same month, with Mrs. R.J. McKenzie as President. The reports from the quilt convener, Refugee knitting, Refugee sewing, and Red Cross sewing conveners were given at each meeting. The lunch committee was in charge of all social events that the ladies organized, serving at teas, concerts, bonspiels and auction sales. One entry, lunches at the bonspiel - January 1 6th to the 27th, showed the grand total of $58.10. The established price for the lunch was: pie and coffee - 15¢, or sandwich and coffee - 20¢. In March, two cushions were donated and the raffled proceeds were to go to the Russian Fund. It was agreed at this meeting to buy braces to go with the little boys' trousers that had been sewn for the refugee children. Large pieces of fur were requested by the Royal Canadian Naval Volunteer Reserve for making fur jackets for the sailors, no fox fur, matted fur or small pieces would be accepted. Bundles for Britain Ditty Bags for the Navy League and "V for Victory" bundles were packed. 1943 was an excellent year as reported by the Erickson and District Red Cross at their annual meeting. $2,726.44 was sent to the Red Cross Headquarters in Winnipeg, $89.50 to the Aid to Russia Fund and $ 117.90 was sent to the Navy League for Ditty Bags… Their report in 1943 showed 525 articles of hospital sewing, 340 articles of knitting, 196 pieces of refugee sewing, 77 pieces of refugee knitting, 86 quilts, 3 baby quilts and 1 blanket accounted for and sent. It was decided to serve lunch at the quilting bee, each bringing their own coffee and sugar, using their own ration coupons. It was reported that 126 lbs., 14 oz. of knitting wool was out, being knitted up into socks, mitts, scarfs, vests, gloves, etc. Mrs. Gusdal reported at the meeting that the Dream Boat quilt would soon be ready for quilting. Mrs. Newman Hall, having made the quilt top, expressed a wish to have it quilted at her home. It was noted in the minutes that lunch slips were sent out to all for teas, etc. rather than phoning, which would indicate that there were very few phones in the area. It was also brought to the attention of the members that a very good blanket could be purchased for $2.75 for refugee relief. Lunch was served at John Carlson's Sale on October 5 , 1943 and the net proceeds were $25.08. At this point in time, the Dream Boat quilt was completed. A convener was appointed, being responsible for making and distributing tickets for the raffle, to take place at Hillstrand's building. The ladies planned an exciting afternoon of filling Ditty Bags for the Navy League and serving tea. However, this grand event had to be cancelled having met with difficulty in securing workers. So it seemed that the Dream Boat quilt had to be raffled at another date, set for November 6th, 1943. At the opening of the meeting in November a special hymn was sung in memory of the late Mrs. H. Miller who had been a faithful worker through the years of World War I , the depression years, when the relief society was active and her later years during World War II. Miss Broadfoot, the public health nurse for this area, attended the meeting, approaching the members about having a "brush up" course in health The matter was talked about, material on the subject sent for, but it was not mentioned or brought up again at any meeting. In 1944, the secretary recorded that they received an appeal for help for Greek relief, for used clothes of all kinds, and need in England for small mats for children to sit on, stuffed toys and toys of any kind, stockings and combs. That summer a motion was made and carried that lunches be served at the Hillstrand building every Saturday night, eight women to work in each group. It is interesting to note that the work of the Women's War Workers didn't close down for the summer months during the war, as was the common practice at the time of compiling this report. It seems that the months of July and August were busy months with the unending meetings, teas, quiltings, sewing, knitting, packing boxes and bales for overseas. There was never an idle moment for these ambitious women. A letter received from Red Cross headquarters stressed an urgent need for more knitted and sewn articles and appealed to every woman to do more in the corning year. The following list from the 1944 Annual report of articles completed and shipped were: 89 quilts, 11 baby quilts, 246 articles for armed forces, 57 articles for civilian relief, and 205 sewn articles. The last event for the year had the ladies serving lunch in the basement of the Scandia Hall on the Poultry Pool packing day with net proceeds of $16.27. In 1945, the journal records that the ladies agreed to serve at the curling rink during the winter season. The prices for the lunches had been set of 20¢, but as the minutes state, if a smaller lunch was served 15¢ could be charged. The sewing convener reported that pajamas and comfort bags were on hand. A letter from Fairfield woolen mills stated that blankets could now be made for the sum of $2.25 and $2.75. The Municipal Council interviewed the group about using the Municipal Hall for teas during the summer and permission was granted. It was suggested that an opening should be cut through the partition to the kitchen. It was decided at this time that the storeroom needed cleaning up on May 8th at 2 p.m. and five ladies volunteered to do this mountainous job. You must remember that all the Red Cross articles were brought to this station from all the outlying areas. New articles that had been sewn and knit, quilts that had been made, used clothes for refugee relief would come in by the box full and these things had to be sorted, checked for buttons and seams and new articles had to have the Canadian Red Cross label. Needless to say the cleaning ladies had a busy day. In December, two letters were received and read from grateful people in England who had been given quilts made by our group. Can there be any greater reward than a "Thank You" to these fine women who worked so faithfully for the War effort? A Christmas Party for the war veterans was organized for December 28th in the form of a whist drive and dance, lunch being two sandwiches, one mince tart and cookie - 20¢. In January of 1946, Mrs. N. Hall resigned as quilt convener, and her resignation was accepted with regret. In the recorded minutes, she had held the position of quilt convener from 1942-1946. A total of 297 quilts had been completed and sent away under her able supervision. A letter from Mrs. R. Smith was read expressing thanks for the work done and announced the closing of the books of the Women's War Workers Committee. She also told of the New Women's Work Committee which was being organized to carry on much of the same work for the Red Cross. All members were in favor of continuing the Red Cross work after summer recess. In October, the ladies held their first meeting after the recess. In September of the following year, 1947, it was agreed that the meetings be discontinued and any utensils, etc. belonging to the society be disposed of at the Annual meeting. In November it was decided to bring to the W.I. and the Legion Auxiliary the need for continuing Red Cross work. In compiling this report only a few names are mentioned but there were many faithful women who gave their time and energy. The ladies who are still with us remember the ones that have moved to new homes and those who have passed away. The Hilltop Women's Club was originally formed as Hilltop Red Cross Subdivision of Erickson Red Cross. The first meeting was held October 23, 1940, in the basement of the Hilltop Baptist Church with 19 ladies present. This club was formed at the request of Dr. Rutledge to get a few ladies together to work for the Red Cross… The club was formed to do knitting, sewing and quilting for the boys overseas and refugees. It was decided to meet monthly at members' homes, charging twenty cents for lunch. Fund-raising events were pie and box socials, amateur hours, raffles and plays, admission: adults fifteen cents, children five cents. $552 was sent to Red Cross headquarters between the years 1943-1945. In addition to the Red Cross Group at Westmount, there was a group of men and women working together for the sole purpose of purchasing a piano for the school. They too, organized in January 1943,.. A deal was made with the Winnipeg Piano Co. Ltd. for a secondhand Bell piano valued at $82.50. Whist drives, card parties, box and tie socials were held at the school, and a thorough canvass was made of the District to raise money. Finally after making payments in March, May and December of 1943, and a final payment in February 1944, the piano was paid for. The Club disbanded, the piano stayed in the school until it closed and then the Westmount Women's Group was given authority to put it up for tender. After the war ended, the need for Red Cross work was less urgent and the group decided to reorganize calling themselves "The Westmount Women's Community Circle". 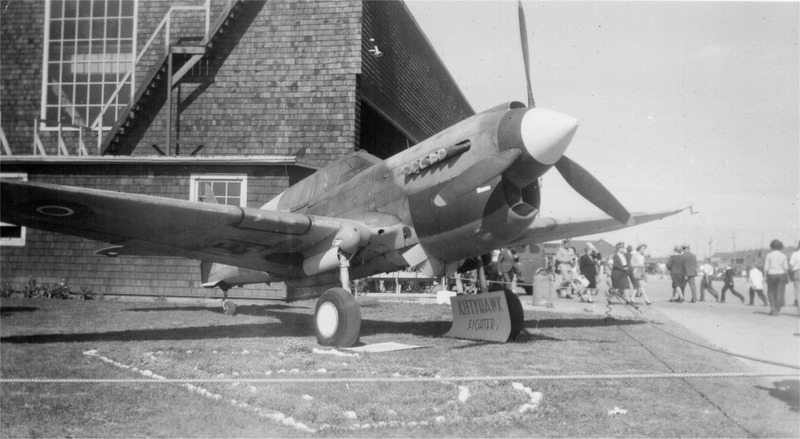 Although the Curtiss P-40 Kittyhawk was not used in the British Commonwealth Air Training Plan, it was a significant fighter-bomber in the Royal Canadian Air Force home defence squadrons. It and variants P-40 Warhawk and P-40 Tomahawk comprised the 13,738 aircraft built by the Curtiss-Wright Corporation between 1939 and 1945, all in the Curtiss-Wright Corporation plant in Buffalo, New York. One hundred and thirty four of the Curtiss Kittlyhawks were obtained for the RCAF through the Lend-Lease Program. They flew operations exclusively for eight Home War Establishment Squadrons on Canada’s east and west coasts. The RCAF utilized the P-40 Tomahawk in four Article XV Squadrons operating in Europe, Africa, the Mediterranean and Southeast Asia. These squadrons were created when the four Commonwealth Countries (Great Britain, Canada, New Zealand and Australia) signed the Riverdale agreement to create the British Commonwealth Air Training Plan. According to Article XV of the agreement, BCATP graduates were to be assigned to squadrons in each of their country’s air forces or to squadrons defined by national identity of the training graduates but under Royal Air Force control. Under RAF control, the squadrons were given numbers in the 400 to 490 range. Canadian squadrons were numbered 400 to 449, Australian squadrons were numbered 450 to 467 and New Zealand squadrons were numbered 485 to 490. Forty-four Canadian, 17 Australian and six New Zealand Article XV squadrons were created during World War II. Despite the formation of 67 national squadrons, most graduates of the BCATP were assigned to British units contrary to the conditions of Article XV. Based on the Curtiss P-36 fighter, the prototype P-40 first flew in 1938 . Other primary users of the P-40 fighters were the United States Army Air Corp, the Royal Australian Air Force and the Royal Air Force. The United States cost to build one of these aircraft in 1941 was $45,000 – equivalent to $624,000 today. When the Japanese Navy occupied territory in the Aleutian Islands, RCAF home defence pilots in P-40 Kittlyhawks from Canada’s 14 and 111 Squadrons worked with the United States Army Air Force to repel the enemy. When these two squadrons returned to Canada, they were redeployed to England without the Kittyhawks. No. 133 Squadron RCAF Patricia Bay saw limited action intercepting Japanese balloon-bombs designed to start fires in remote British Columbia as did members of RCAF 135 Squadron. All of the Canadian based P-40 Kittyhawk squadrons specialized in maritime patrol and defence over the Atlantic and Pacific Oceans. Canadian P-40, Article XV squadrons serving in the UK under direct command and control of the RAF, with RAF owned aircraft.